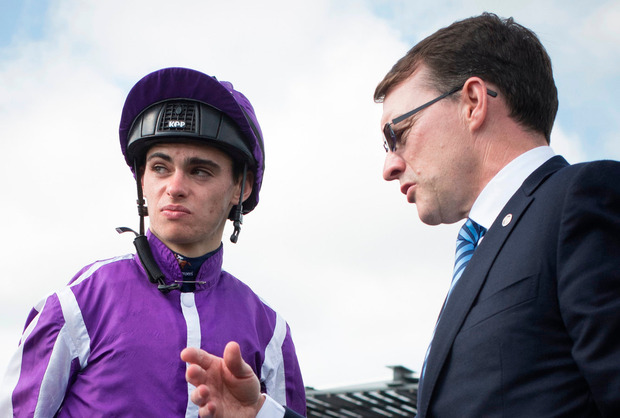 Donnacha O'Brien's pursuit of a first jockeys championship looks likely to get a further boost at Gowran Park this evening. If O'Brien does manage to hold on to his current lead at the top of the championship he will not only join some greats on an elite list but do so in quite a unique manner. Father Aidan and brother are Joseph are the only two trainers that Donnacha O'Brien has ridden for in Ireland this season and rarely has he ridden below 9st. That does of course speak volumes about the fire power available at Ballydoyle and Pilltown and Donnacha looks to have a good chance of riding a winner for each of his main supporters tonight. In the opening Irish EBF Supporting Irish Champions Weekend Maiden it is South Pacific who gets the nod. The son of Galileo was a neck away from opening his account last time and should be good enough at the third time of asking for the champion trainer, Aidan. The form of South Pacific's two maiden runs has worked out well and he is preferred over Jessica Harrington's Boston Bruin. Joseph O'Brien provides his younger brother with his second ride on the card this evening and Waitingfortheday is aided with to get back to winning ways. The three-year-old has gone up 30lbs for winning four on the bounce and being just touched off by a head last time out and she still might not be finished yet. Dermot Weld's Tashman is an obvious danger here but Waitingfortheday lost little in defeat last time and after a little time off she could well defy top weight here. Donnacha's apprentice days are well and truly over so he doesn't get to ride Perfect Tapatino in the second division of the apprentice race but Joseph's Curragh winner should oblige for the second time in four days. Sean Crosse, who himself is in the mix for the apprentice championship, rides the selection for his boss and in what looks like a moderate enough heat Perfect Tapatino should prove too good. The first division may well go the way of father and son partnership Niall and Tom Madden. Finvarra ran a blinder at Cork last time staying on well and nearly landing some nice bets in the process but stepping up to a mile here should be ideal for the three-year-old. Herald columnist Declan McDonogh has got his own couple of chances on the card and may well be in line for a quick fire double of his own with Rayda and Aztec Eagle near the end of the card. Rayda was fourth at this track on her only start and although taking on the geldings she could be a typical Aga Khan-owned improver for Dermot Weld. Aztec Eagle jumps into handicap company after winning his maiden at Cork and while he will lack experience, the form of his win has produced winners and a rating of 82 might prove somewhat lenient for the horse that carries the colours of Noel Furlong. Colin Keane is a positive booking for Tramore winner Backsheesh in the finale, while the reigning champion jockey is a tentative choice on Zalzar for his boss Ger Lyons in the claimer.